Kodiak National Wildlife Refuge biologists just wrapped up this season’s field work monitoring berry supply in relation to the health of bear populations. They’ve been assessing berry patches and doing aerial surveys for bears. 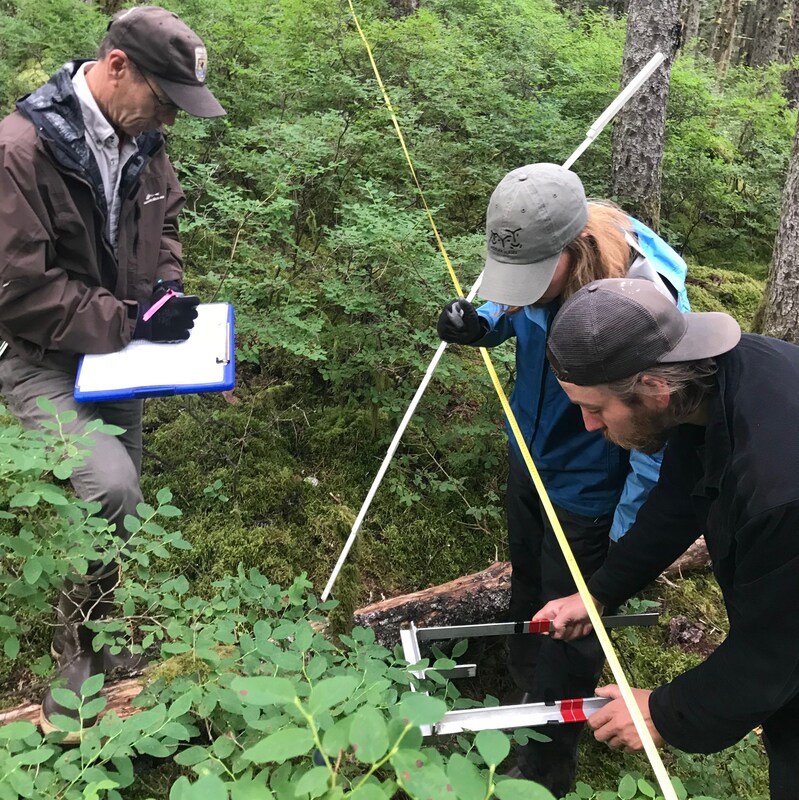 The surveys lay the groundwork to create a baseline from which to measure how climate change and other factors may be affecting this particular aspect of Kodiak’s bear foraging habitat. 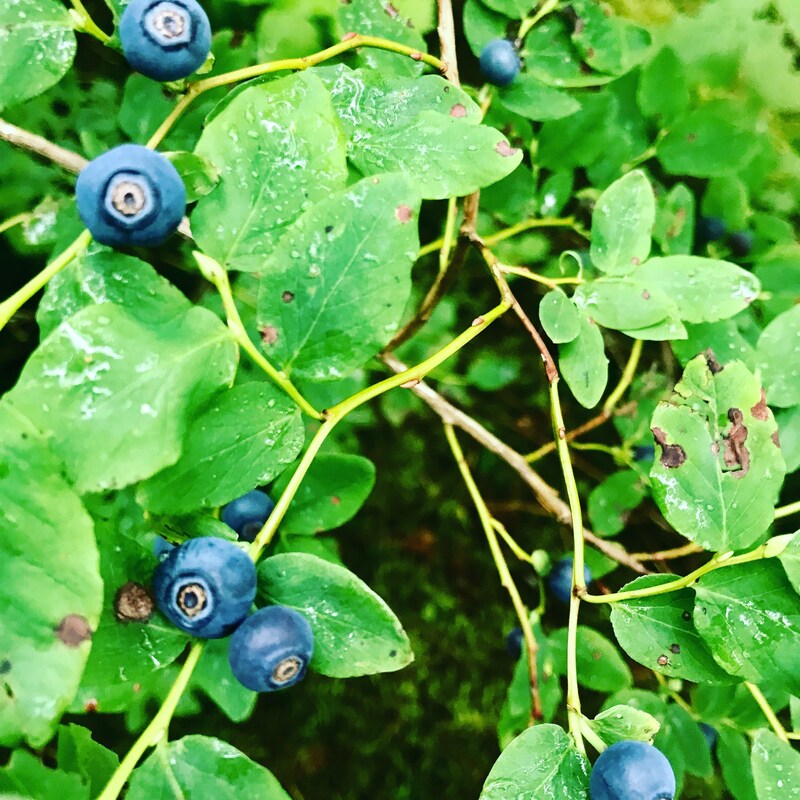 “We come back about the same time each year to sample the abundance of blueberry and devil’s club,” said Bill Pyle, the supervisory wildlife biologist with Kodiak National Wildlife Refuge. Pyle walks a trail in Abercrombie State Park where he is leading a team surveying for an abundance of blueberries. They’ve already surveyed for salmonberry and elderberry. “It is much better than it was last year where we had conditions during the winter that knocked out the production, and there wasn’t really any berries to be had for people and wildlife,” Pyle said. Last year was a terrible year for berries. On the north and west side of the island, there was virtually no production of three of the four species: salmonberry, elderberry, and blueberry. Devil’s club was the one exception. Biologists still don’t know exactly how it impacted bears and other animals here, but they are hoping to find out. Pyle said low snow cover left shrubs unprotected from the cold and exposed to browsing deer. Berries are a critical food source for bears and help them put on fat for winter. The U.S. Fish and Wildlife Service has been doing the surveys for the past four years as part of a long-term look at climate variations’ effects on bears and bear habitat. They modeled their survey after another in the Rocky Mountains. In the short term, they’re trying to sort out how much last season’s low berry production affected the island’s iconic bears. Pyle and his crew divert from the path, arriving at a vast patch of the 5- to 8-foot shrubs above a pond and under a canopy of tall Sitka Spruce. The bushes are loaded. Vaccinium ovalifolium, or oval-leaf blueberry, is not superabundant on Kodiak and, biologists say that like Sitka spruce it is still in the process of colonizing the archipelago. This work requires sturdy boots and some bushwhacking. Crew member Danny Hernandez stretches a long measuring tape from a metal stake in the ground to another one up the hill. Catie Thow is a volunteer on the project. Hernandez and Thow work together along the transect counting and measuring while Pyle writes down the data. It is painstaking work, but once all the numbers are in, they’ll paint a picture about what is happening for bears and bear habitat on the island which hasn’t been available before and which may become even more important to understand as the climate changes. Pyle says they just completed their final survey of devil’s club berry clusters. Next, they’ll take the berry data and do some complicated math comparing it with the data gathered from bear surveys. Pyle acknowledges there’s another species whose survival doesn’t necessarily depend on the berries, but that could benefit from the surveys: humans. The study, Pyle adds, may also have value for local subsistence users and hunters. As well as for the tourism industry, which, on Kodiak, is deeply connected to the health of the bear population.